Juneathon day 30/30 - Fin. 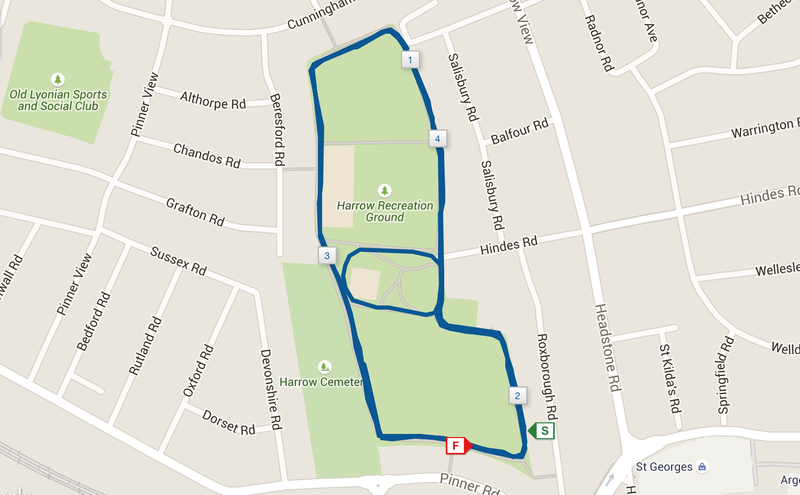 This morning's run was lovely, two laps of the park near work before work time, much love to Mrs for suggesting it. Really happy I finished Juneathon with a new run. Penultimate day of Juneathon and my legs were surprisingly sprightly sprightly this evening after yesterday's half marathon. The results were published and my official gun time is 2:00:07 - just eight tiny seconds from sub-2! Oh well, as I said, better go back and do it next year. Just the easy local 5km for me this evening, a box-ticker if ever there was. Looking forward to tomorrow's final Juneathon run which will see me complete the month with just over 250km on the clock. I was a bit worried about today's Hitchin hard half marathon - half marathons seem to present the perfect balance of distance vs time vs effort to irritate my ITBS. Both bouts have been brought on by halves, both by the same half in fact - the Royal Parks Half, and both times I've been disillusioned and off running for at least six months afterwards. Today's course was very different to those. Far fewer people, significantly more climbing and descending, and the 28th day of my Juneathon run streak (as explained earlier, actually the 30th day running in a row). Mrs was running it too (her race report is here) - a big challenge and milestone for her as she continues her recovery from ankle surgery. To think that just 5 months ago she couldn't walk, and is now toeing the line at a hilly half. Much love and respect for that. We were off at 9:30, a couple of repetitions of a hill in the grounds of The Priory, and then out onto the open road. The roads were not closed to traffic so we had to keep an eye and an ear out for cars (no headphones allowed! ), but it didn't cause any trouble - the roads were very quiet. My race plan was to finish strong, I wasn't particularly concerned about time but two hours is a nice benchmark. I set off at a measured pace, cadence high, breathing easily. I walked the particularly steep hills, probably about five walking periods during the race. Like always, most people started too fast and put too much effort in up the hills. For the first quarter I let people run away, I was fairly near the back but I knew I'd see them again. The middle half I saw the same faces. They'd run past me as I hiked up hill, then I'd set off at the top and overtake them easily as I was fresher. Repeat (several times!). You can clearly see an increase in pace starting from about 1:30 - and the sprint finish! The day was humid but stayed mainly dry until the last quarter. I decided to start seeing what I had in the tank and was easily able to draw people in and overtake. The light drizzle turned to rain in the last few km, I pushed harder. I overtook many more people in the last quarter than I was expecting to - a sign of good pacing control at the start, saving myself by walking the hills, and having some gas in the tank. There's a long shallow uphill to get back to the grounds of the Priory, that part I found quite sapping, but pushed on. For the last km I was wondering if I might make it under two hours - it was going to be tight. The finish was on a grassy downhill, so I pushed hard, overtook a few people (including blowing past two guys who were in the middle of a sprint to the line!) and stopped my watch. My watch read 2:00:13! I'll have to wait for the official result, but I doubt it'll disagree by as much as the 14 seconds I'd need to get under 2 hours. I'm very happy with my performance, and the race. Mrs ran well too, coming in well in the bracket she was aiming for. After a nice cup of tea, and unexpected chat with my friend Bob who it turns out is part of the race organising team, it was back to the in-laws for buckets of tea and a massive fry-up - perfect! Looks like I'll have to come back next year for the sub-2! A relatively relaxed start as parkrun tourism goes, up at 7am and out of the house at around half past. I was looking for something easy and near as we have a packed day today. Harrow parkrun started a few weeks ago, today was the 4th event - a perfect time for a tourist visit. Harrow Recreation Ground was just a short walk form Harrow-on-the-Hill underground station. I made good time and arrived with 15 minutes to spare. The park was beautiful in the sun, it really was a glorious morning for a run. I took a lap of the park at a gentle jog, and then milled about with the other 100 or so runners to await the briefing and start. My plan was to run at an easy pace with a little burst of speed for 100m or so each km to turn my legs over ahead of tomorrow's half marathon. The course was all on concrete paths, a little narrow in places but the field was well spread out. A slight drag up a rise each lap caught a few people out. Plan was executed perfectly, though I'm not sure my fellow park runners always appreciated me taking off like a scared bunny every few minutes. I got lap by the first finisher as I was completing my second lap - he recorded a time of 16:22, he flew past me! All in all, a very enjoyable run in the park. As always, thank you parkrun, and thank you volunteers. Felt a lot more up for it today, but don't want to push the distance given the tough half marathon coming on Sunday I elected to take a train to Clapham Junction and run to work from there. Gentle trot, consistent effort, average pace, no stress. Job done! Juneathon, the end is in sight! For the first time in Juneathon I really didn't fancy it this evening. It's late and I'm tired. 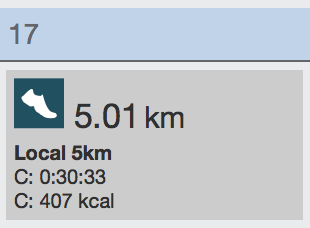 Pleasingly one of the reasons isn't that I'm aching from yesterday's run - I've bounced back well from that. In any case, I just trundled round the local 5km loop. Again. Juneathon day 24/30 - "Much better, thank you, Aziz!" Finished work and left for Croydon, already changed into my running gear. Determined to go to Croydon and hit another lap of the Croydon Ultra route. Thankfully the route is very different to my route home, so once I'd got to Victoria I was committed. 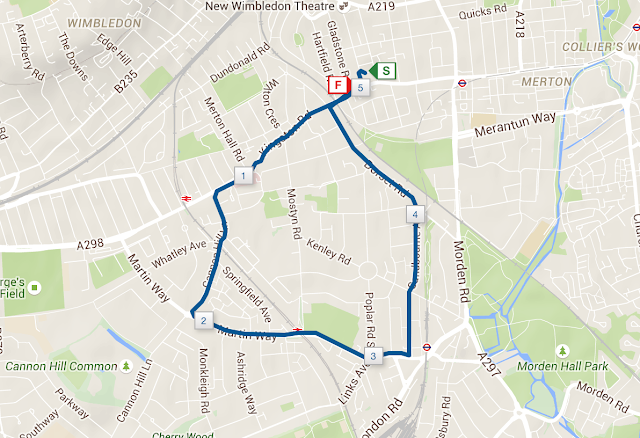 It was well under an hour from desk to Lloyd Park tram stop, the start/finish of the lap. 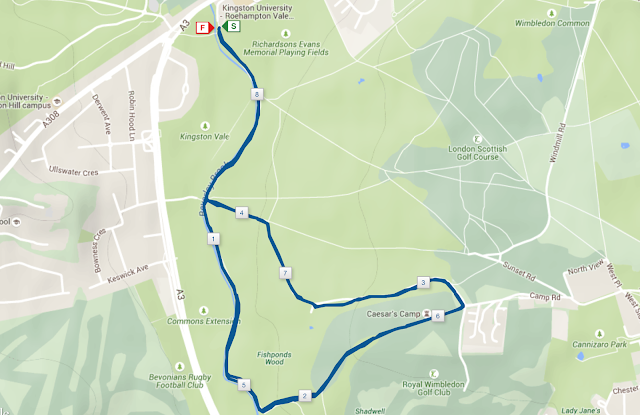 I decided on a change to Sunday's plan - this time I would walk all the up-hills, regardless of how long they were, and run the flats and downhills. Not running the ups really helped, I had much more energy throughout. I stopped at the petrol station again for water, but was feeling good. All the death march walking I did on Sunday was runnable today, and I completed the lap a massive 25 minutes faster coming in at 2:52:57 - and shaving off about a kilometre through knowing where I was going and not making mistakes. Much better, thank you, Aziz! I still think two laps is going to be hard, but it's supposed to be - it's an ultra marathon. But, unlike Sunday, I at least now feel it's achievable. But first, I have to get through the ominously named "Hitchin hard half marathon"; I understand hills may be involved. Surprisingly my legs felt fine today after yesterdays run/walk, so I was looking forward to a little out and back with Mrs. Her training plan called for 40 minutes easy with three efforts of 60 seconds at 5km pace. 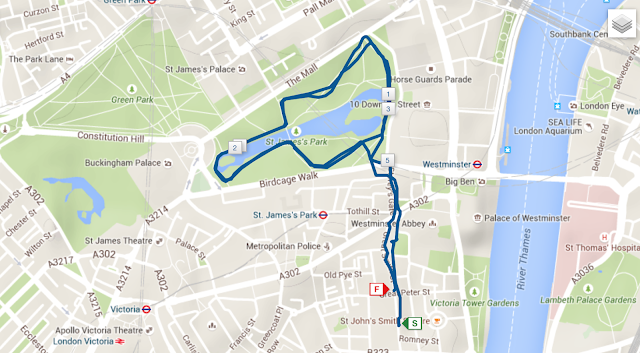 We took one of our regular out and back routes. It was nice to put a bit of effort in at the end, I haven't done much fast running lately. Must work some efforts in more regularly. 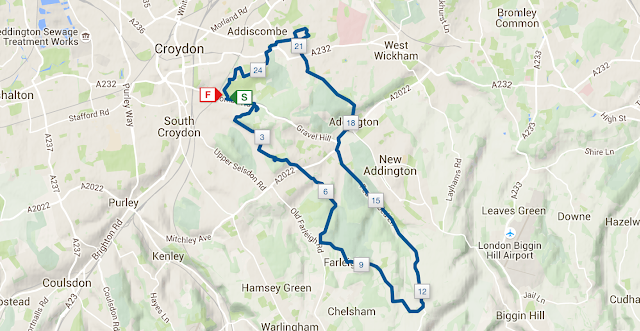 I'm hoping to work in another Croydon Ultra lap on Wednesday after work, see how the legs hold up! After a most frustrating morning trying to get a map onto my Garmin Edge 705 to use as a hand-held GPS where all I actually ended up doing was getting angry and uploading 300 junk activities to Garmin connect (and still couldn't copy the map...) - I went, armed with Mrs' bike computer, to the tram. The 30 mile Croydon Ultra route starts at Lloyd Park stop on the Croydon Tramlink which conveniently also has a stop 200m from my front door. Getting to and from the race on July 5th will not be a problem. The route is hillier than I'm used to, though small fry compared to most. Two laps of fifteen miles. I started well, save for a couple of navigational errors, running for nine minutes, walking for one, and hiking the hills. The trail sections were really good fun, I'm starting to really get a lot of enjoyment from running off-road. But after five or six miles it became more on road and footpath. My feet got tired and I found it hard to start running after my minute walk. Graph of altitude and pace - the walking bit at the end is fairly plain to see! Stopped for an emergency bottle of water and Pepperami from a petrol station, and pushed on. In the end I walked most of the last couple of miles. My longest run for a long time, I'm not really "long run fit", but we'll see what happens. Today was 25.75km in 3:17:49 (including Pepperami stop). It was good to have an image of what I'll be up against in a fortnight - I'm not sure how I'm going to get round twice though! Today marks the 2/3 point through Juneathon, 20 days of consecutive running out of the 30 day challenge. I decided to celebrate by attending an inaugural parkrun event. Inaugural events have taken on an odd hue of late - the number of inaugurals attended used to be on the most events table and qualify you for entry onto the table, but the column disappeared a while ago. There followed a sustained period of heated debate about if tourists should go to inaugural events at all as it places a heavy (believed to be unacceptable) extra load on the brand new team at their first event. There were tales of stressed event teams, and much anxiety. There were also plenty of stressed tourists who had enjoyed inaugural hunting as a kind of purist element of parkrun tourism. We also knew that at an inaugural (when there was generally only one on any given Saturday) we were likely to see our fellow tourists. Unfortunately I think the hyperbole on the topic didn't do much to give new event teams confidence - they imagined uncontrollable hordes of tourists descending on their parks and overwhelming them. We started to see communications from new events requesting that tourists wait a week or two before visiting. A visit to an inaugural became something you didn't really shout about, attending a first run event risks community disapproval and attending an event on its second, third, or fourth running becomes a badge of honour. I stayed out of the debate, the Internet - and in particular Facebook - is not the place for nuanced conversation! As it was I did pull back from inaugural hunting, but I miss them. I like the joy on the faces of new parkrun parents as their pride and joy comes to life. I like that no one knows where the course is or the route, and the excited discussion afterwards about "that bit with the mud" or "the wobbly bridge". So I will be going to inaugurals when it's convenient, I may even travel a bit like I have done before. But I will keep an eye out on the tourist Facebook groups and if a new event is worried and would prefer a softer start, I'll show some respect and attend at a later date. 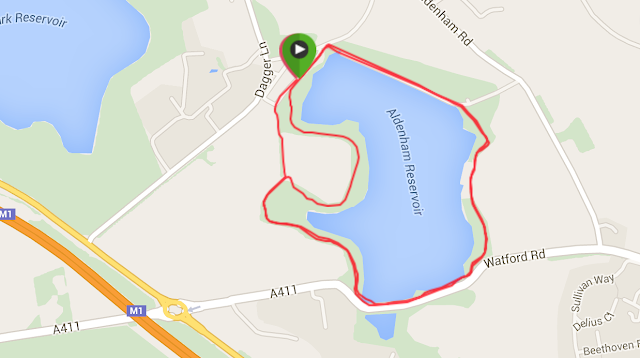 Aldenham parkrun's first event. It was a nice morning for running, not too hot, quite overcast, and the odd spot of rain. We got to Aldenham Country Park at around 8:35 and immediately spotted some parkrun regulars to catch up with. 100 Aker Wood (as featured in Winnie the Pooh) seems to be the biggest attraction, and around the grounds are the houses of the characters. Nicola took some great photos in the wood - I wish I'd had a wander round myself now! The run was a good one - I decided to go for a bit of (what I call) pace after plodding along for most of Juneathon so far. The surfaces were good, some concrete along the Northern side of the reservoir and mainly firm trail through woodland for the rest. Pacing was good at around 5 minutes per km for the first 4km, and then a faster one to finish - my official time being 24:49, a second better than my watch time. There were 78 finishers in the end, a lovely size for a new parkrun. The event team were happy, and the runners gave unanimous praise. Good luck for the future, Aldenham parkrun! Juneathon day 19/30 - Lie-in vs Run, who won? Lie-in won, so I didn't repeat last night's nine minute run and one minute walk commute. Instead I had a bit more sleep, got the train to Clapham Junction, and ran to work from there. I was achy from yesterday's 16km run/walk, but as soon as I started running I felt fine. 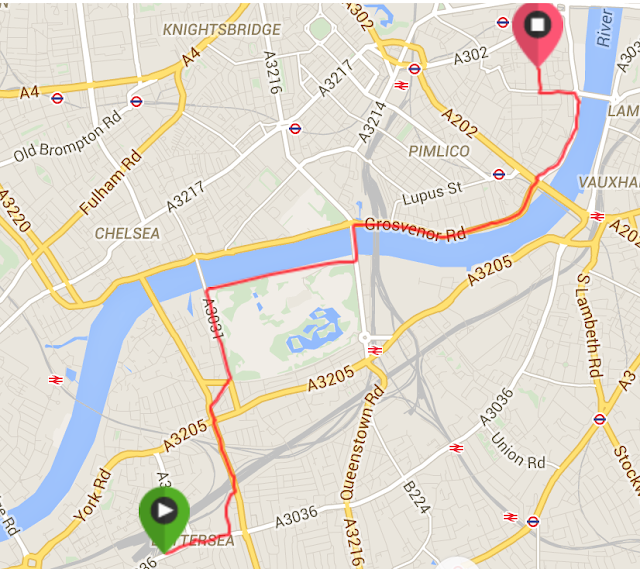 So just another 6.86km in 41:06 for today. Shorter than intended, but a good run - refreshing! 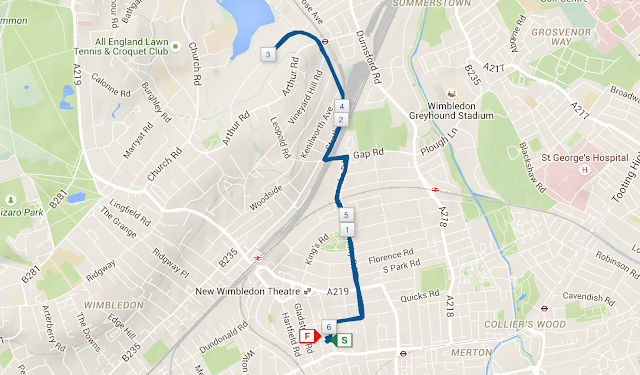 I plan to complete the Croydon Ultra the same way I ran the Wales Marathon last year - with a 9 minute jog and 1 minute walk pattern. I haven't been completing any long runs lately so I shouldn't attempt 30 miles straight. I decided to practice on the way home today, a lovely run down by the Thames, through Putney, over Wimbledon Common, through the village, and down to home. Sunny all the way, everyone out and smiling - a lovely run! So a longer run today, planning on the same run back in to work tomorrow to get a bit of "back to back" run action, then a fast parkrun on Saturday and a proper long run on Sunday - I'm intending to do a lap of the ultra course, not run 15 miles for a long time! 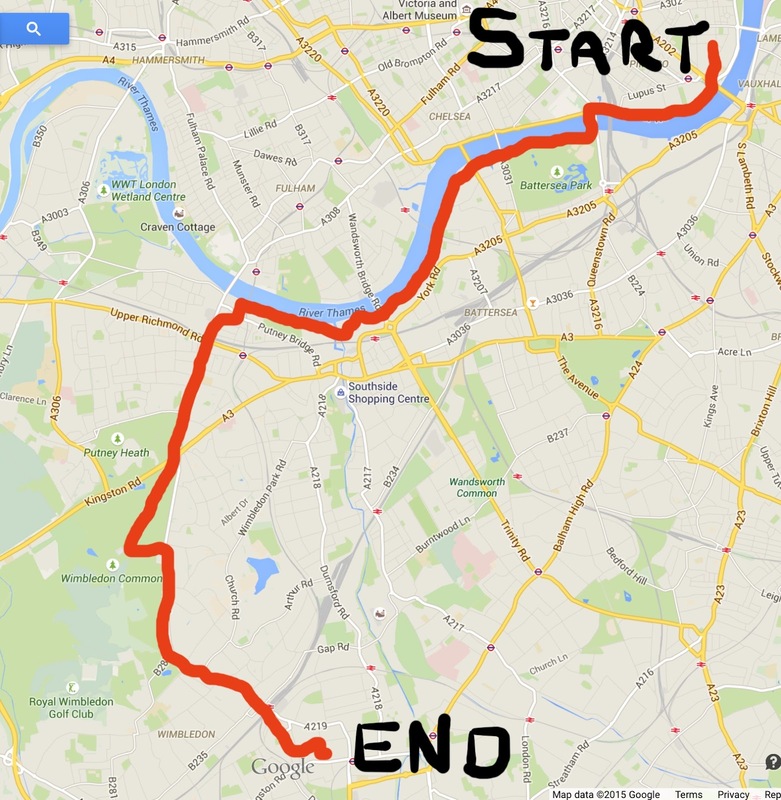 Today's 16.76km is my longest Juneathon run yet, in a relaxed and sustainable 1:47:09. I'm hoping to complete Sunday's lap in around 3 hours. We'll see! Back to the local loop this evening - supremely humid out, been sweating like a sweaty thing all day! Garmin Connect is broken so I can't upload my evidence, so here's the manual entry in Training Peaks. You're just going to have to trust me. Juneathon day 15/30 - Half way! Half way through Juneathon and my second slightly tipsy run. Had a great team building afternoon at work and went for a curry afterwards, and a glass of vin rouge or two. Walked back to work afterwards, got changed, and ran to Clapham Junction - 6.71km in 37:11, quite pleased with that! Takes me to over 10 hours of Juneathon running, and over 100km in total. Running felt easy this evening, very happy! This morning was the second running of the Thames Hare & Hounds running club's Second Sunday 5, a new regular 5-mile race race held on Wimbledon Common on the second Sunday of each month. I ran the first event a month ago and finished about two-thirds down the field. The field was smaller this time, and everyone looked quite capable - uh oh! We started on time at 09:30 and, no exaggeration, everyone else shot off into the distance! I managed to keep the back couple in my sights, but due to the twists and turns of the course by the end of the first mile I could only see the red shirt of the chap in second to last place. I ran up the hill on the first lap, but on the second had to walk at the start. I used the down hill on both occasions to push hard and try and minimise the impact of my very slow uphill running. For the entire race I was running on my own, but for the last two miles I couldn't even see the guy in front, so it was up to me to buckle down and keep applying the pressure. I pushed hard right to the end and, despite coming dead last, was proud of my performance. I don't think I could have pushed any harder, and finished drenched in sweat! This Sunday also marks the end of the first two full weeks of June and therefore my 14th consecutive day running for Juneathon, which marks the 16th day of this run streak. I remember when looking at training plans for triathlon a long time ago now being very concerned about running on consecutive days - now I'm up to 16 consecutive days. Run streaks are nothing new, there are people who have run every day for decades! At the moment, I'll just claim every day of my 5th decade so far. I'm starting to wonder what happens on July 1st - will I be happy stopping at 30 days? There's a guy on twitter who ran every day for Janathon in 2011 and simply didn't stop, and he's still going now. Edit: A couple of people have already tweeted about British Olympian Ron Hill's incredible (and still ongoing) 50 year running streak. Here's a link to a BBC article on his amazing achievement.